It can be tricky to add personality or a point of difference to your look it's icy—there's only so many ways you can wear a chunky scarf and coat. But pictures of Olivia Palermo, our constant source of style inspiration, in New York over the weekend show an easy styling trick that will make you fall in love with your winter coat all over again. When we got over that she had dressed her dog in little yellow shoes (seriously), our eyes were drawn to her black belt, which she had looped into an interesting knot. To reinvent your everyday winter coat, follow Olivia's lead and remove the built-in belt and replace it with a chunky leather style. The added bonus is it also helps the waist to look more defined. 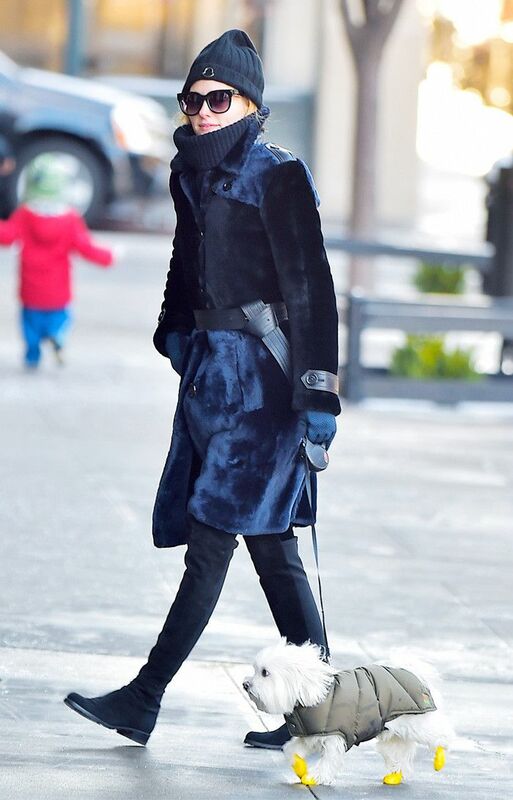 On Olivia Palermo: Moncler Hat; Stuart Weitzman boots and Maximilian coat. 1) Wrap the belt around your waist, not feeding it through the belt loops in your coat. Opt for a longer belt so you have more length to play with. 2) Position the belt towards your left hand side, rather than in the centre as usual. 3) Fasten the belt normally, but do not put it through any belt loops and if possible opt for a belt without any loops. 4) Then feed the belt in the opposite direction than usual at a slight angle so you can loop it underneath the belt. Then pull it through to the other side and feed it through in between the two pieces of belt to create a tight knot. This twist has been a blogger and Pinterest favourite for some time—Blair Eadie of Atlantic-Pacific often uses this as a way to add another dimension to a classic pair of jeans or a summer dress. But knotting a belt over outerwear is one nifty styling trick that we haven't seen all over Pinterest (yet). Scroll below for our edit of the best belts to get the look. For an easier option, opt for Isabel Marant's belt with an in-built knot. This classic black belt would look particularly striking over a camel coat.